As comfortable as the seat bench is, when Felix begins his camera tour Julia is happy to put aside her sketching block. Completely new furniture forms and shapes with low weights but tried‐and‐tested stability. This is where you can easily charge your tablets and laptops easily with your USB cable. 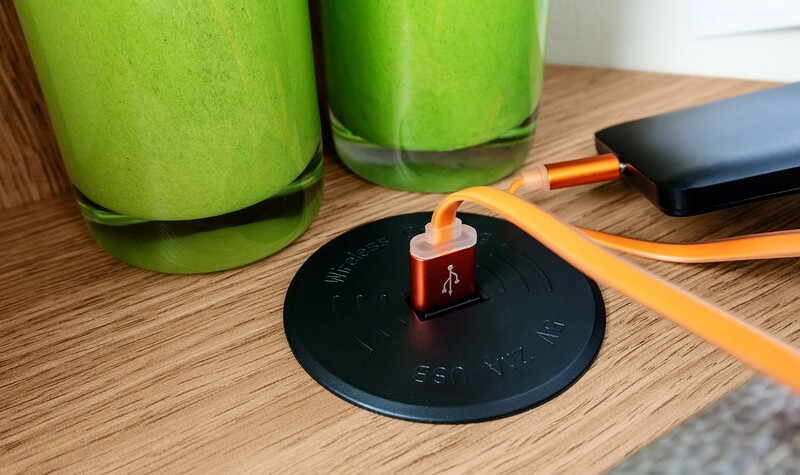 One special feature: Smartphones can be wirelessly charged through induction. 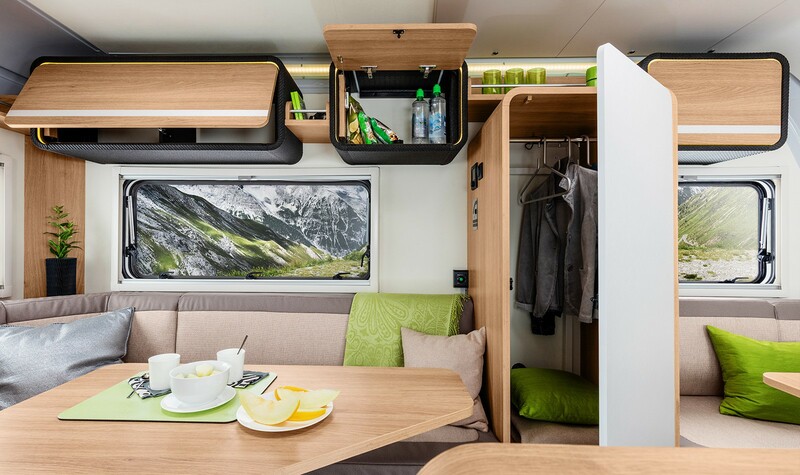 In addition, through the direct integration into the furniture carcase behind the seat bench, the socket is not noticeable and offers a secure storage spot. 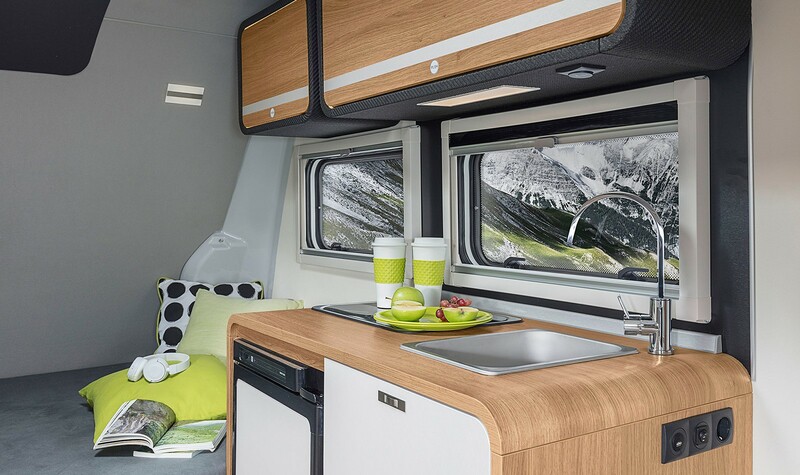 In the compact kitchen with modern furniture, Julia makes a perfect soup. And that gives Felix two reasons to be happy. Lots of storage space and an extending countertop, so that you can organise your workspace optimally. 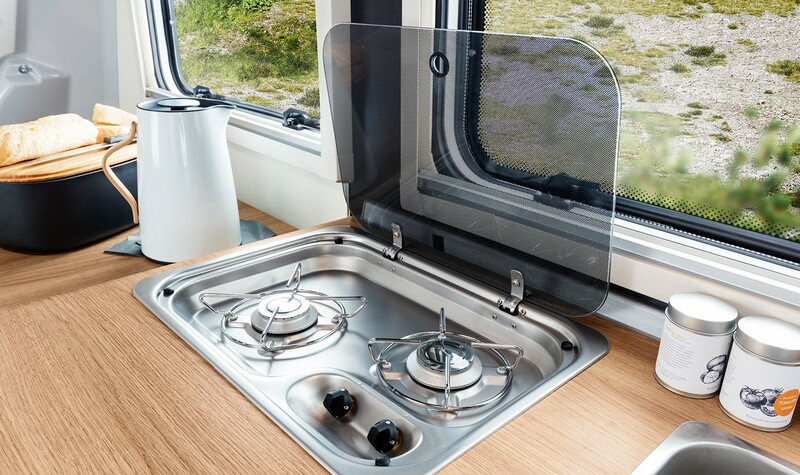 Even in an ultralight caravan, a refrigerator for your supplies must be on board. Thanks to the carcase made of expandable polypropylene, an entire wall unit only weighs a few kilos but still stores your kitchen utensils without a problem. Julia gets wide‐eyed when Felix quickly converts the seat bench into a bed. There would even be room for visitors on the guest bed. 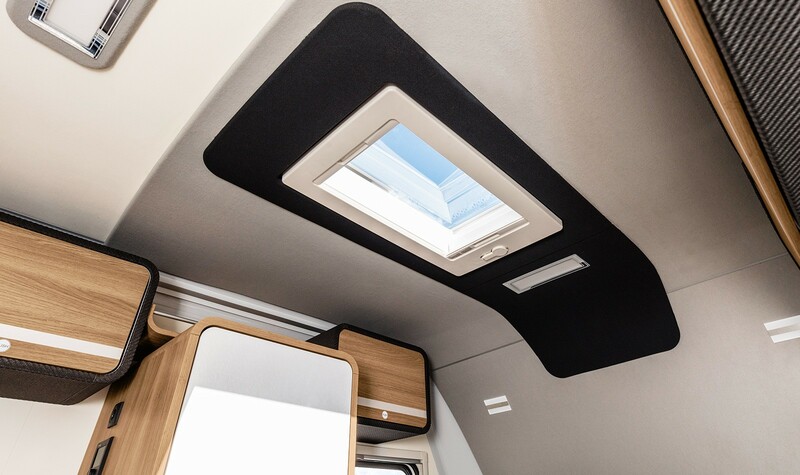 The edging of the skylight in dark material brings dynamics into the interior design. 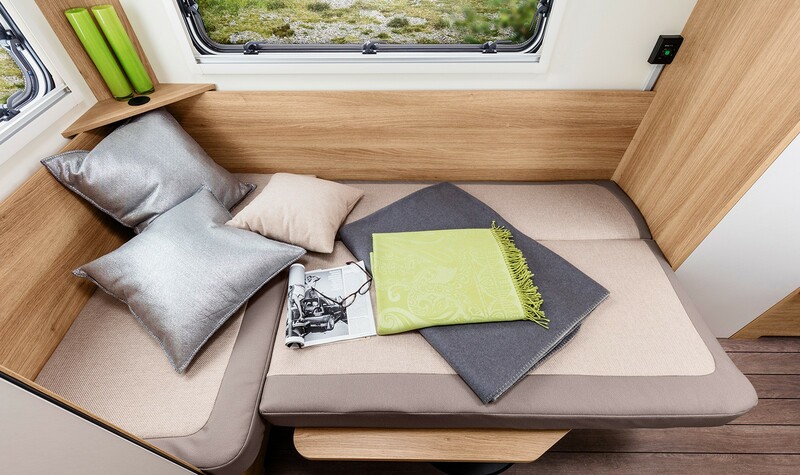 Instead of the series transversal bed in the front, TRAVELINO also optionally provides two seating group in the rear and front. With only a few moves, both can be transformed into a double bed so that four places to sleep are created. 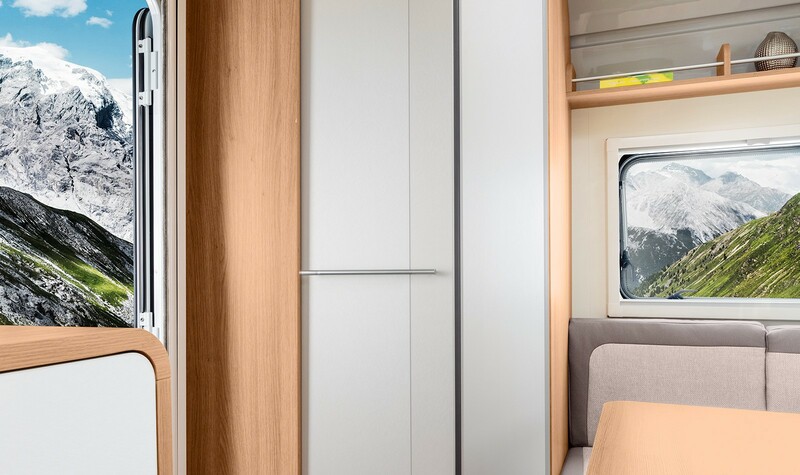 What looks like a wardrobe door, is in reality the bathroom. If required, space‐saving and easy to use. For more range of motion and a better spatial feeling, you can cut the size of the bathroom in half. As long as nobody is using it, of course. 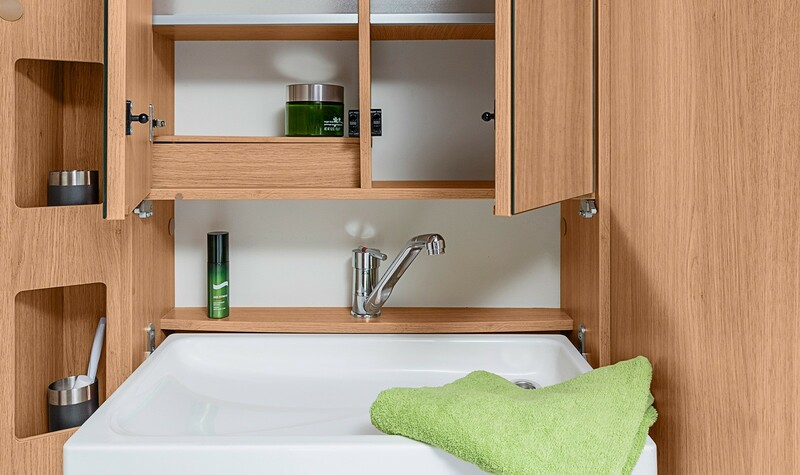 Thanks to the spacious mirror cabinet, foldable washbasin and additional shelves.